Aaron Donald began at 70-1 to win the Super Bowl MVP, but received so much action the sportsbooks reduced his odds to 15-1. Several high stakes Super Bowl bets came in on the Los Angeles Rams late in the week, including some greater than $1 million. According to several reports, Bettor X also placed a $1.5 million bet on the L.A. Rams. Bettor X is the name given to the mysterious sports bettor who won $10 million on the World Series between the Los Angeles Dodgers and the Houston Astros in 2017. The bettor won each single-game bet, doubling up his winnings until it equaled $10 million. Before last year’s Super Bowl, Bettor X made a wager of $8 million to $10 million (according to the source) on the Philadelphia Eagles to defeat the New England Patriots last year. When the bet won, Bettor X received $25 million in winnings. If the Rams win their +120 bet which Bettor X placed this time, he or she will win $1.8 million. William Hill US is the sportsbook which took the bet, which came in on Friday. The South Point Casino reported taking a $300 thousand money-line bet on the Rams, according to Vegas Stats & Information Network (VSIN) and RotoGrinders. Jay Rood, the VP of Race & Sports at MGM Resorts, said that a gambler made a seven-figure point spread bet on the favored New England Patriots on Saturday. The wager was on a -2.5 point spread for the Patriots, which means New England would have to win by 3 or more points for the gambler to win the bet. Mr. Rood told Gil Alexander of VSIN that the gambler had won a substantial bet on the Patriots in the AFC Championship Game over the Kansas City Chiefs. The gambler decided to roll over the bet on the Patriots in the Super Bowl. Jay Rood said the action has been roughly 50/50 over the past 48 hours. MGM’s sports betting director emphasized that most of the betting action for the Super Bowl will take place on Saturday or Sunday, so the lines could change in the final hours of wagering. The New England Patriots remain a -2.5 favorite to defeat the Rams in Super Bowl 53. Most of the wagers over the past two weeks have been small-money bets on the Patriots to win, so they are the clear favorite among the betting public. The first nine reported 5-figure bets (early on) were on the Patriots, though. The over/under on the game sits at 56.5 total points at the moment. The original over/under was 59 points, which is a record for the Super Bowl. In the first 24 hours of wagering, bettors took the over/under total to 58 or 57.5, but the total has declined once again in the past week. Handicappers (professional sports bettors) have their own systems for determining how to bet, but it is a good rule of thumb to wager against the betting public. This goes on the assumption that the oddsmakers who set the line for a sportsbook knows more about the game than the betting public, who mostly are amateurs going on gut instinct, fan favorites, or hometown loyalties. 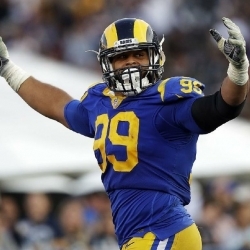 Aaron Donald: Super Bowl MVP? Jay Rood said that Aaron Donald winning the Super Bowl MVP award would be a huge loss for MGM Resorts. After Aaron Donald was installed as a 70 to 1 underdog to win the Super Bowl MVP award, so many wagers came in on Donald that the sportsbook had to lower his odds to 15 to 1.